Tottenham boss Tim Sherwood has hit out at managers "touting" for his job, given he has a year left on his deal. There has been speculation Netherlands coach Louis van Gaal would take over at Spurs, although he is now widely tipped to become Manchester United's new boss. Ajax coach Frank de Boer, Southampton's Mauricio Pochettino and ex-England boss Glenn Hoddle have also been linked. "Some of these managers are touting themselves for my job, I don't think that's right," the 45-year-old said. "Every press conference I do it's 'this manager's coming in' - van Gaal, then Hoddle, this one and that one. "It's something that doesn't sit well with me. If anyone ever asks me about another job I just tell them that they've got another manager. "Until they haven't got a manager and until I haven't got a job, say nothing." Sherwood, who took charge of Tottenham in December following the sacking of Andre Villas-Boas, is two victories shy of equalling the north London club's highest Premier League points total of 72 - achieved last season - after winning 12 of his 20 games in charge. 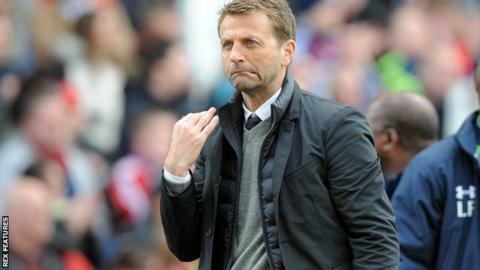 "I've done all right, you know, it's been hard," Sherwood added, following Saturday's 1-0 win at Stoke City. "I've had to keep my discipline, I suppose, and my dignity, pride and just get on with the job. "That's all I've tried to do. It is an honour to manage this football club and long may it continue."